AUTHOR INFORMATION: Marissa Meyer lives in Tacoma, Washington. Scarlet is her second novel, following on the success of her debut, Cinder. Author information can also be found at marissameyer.com. OFFICIAL SYNOPSIS: Cinder, the cyborg mechanic, returns in the second thrilling installment of the bestselling Lunar Chronicles. She's trying to break out of prison—even though if she succeeds, she'll be the Commonwealth's most wanted fugitive. FORMAT/INFO: Scarlet is 322 pages in NOOK format (and is listed as 464 pages in hardcover) and has forty-seven chapters. The narration is third-person and provides the perspective of several characters, including Cinder, Prince Kai, Scarlet, and Wolf. 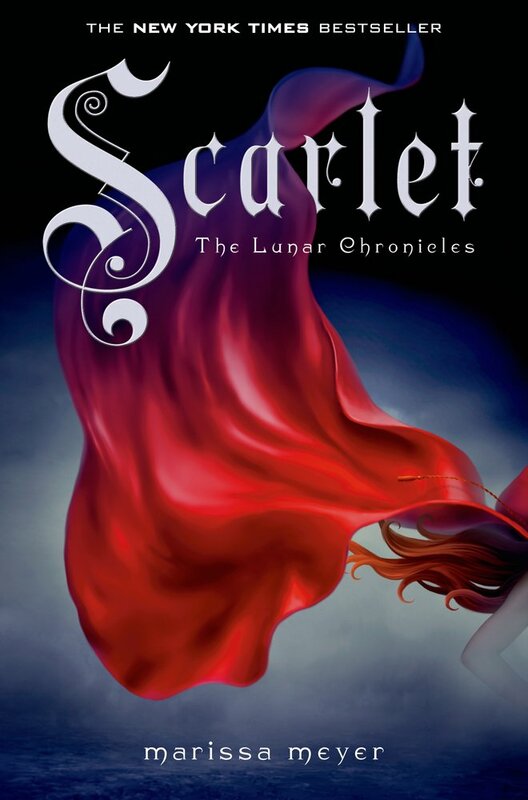 Scarlet is the second volume in The Lunar Chronicles quartet, following the book, Cinder. Scarlet was published in hardcover by Feiwel & Friends on February 3, 2013. The UK version was published on February 7, 2013 via Puffin Books. ANALYSIS: Scarlet Benoit is a young woman with a lot going on in her life. Her grandmother, Michelle Benoit, is missing; the police have dismissed the case, and she is left to maintain their farm and produce delivery business. From the start of the book, we are shown that Scarlet has a fiery personality to match her vivid hair. While making a delivery to the bar of one of her regular clients, Scarlet overhears patrons heckling in response to a news bulletin showing what is being called Cinder’s attempted assassination of either Emporer Kai or the Lunar Queen Levana. The comments are certainly in poor taste given that Cinder, a mere teenager, is going to be executed without any type of trial, and Scarlet reacts without thinking, climbing onto the bar and disconnecting the cable, knocking over glasses as she does so. From the reaction she gets, we learn that her missing grandmother has long been rumored to be crazy, and people wonder if Scarlet might not also be herself. Wolf, a young street fighter, is also introduced in the bar scene. He is shy and awkward, but handsome, and Scarlet is drawn to him even before he intervenes when she gets into a skirmish with one of the bar patrons. Later, he tries to get work at Scarlet’s farm. Though that doesn’t work out, she does allow him to accompany her when she decides to go to rescue her grandmother after finding out that she has indeed been kidnapped. Interspersed through the chapters involving Scarlet and Wolf are those that further Cinder’s story. She uses the tools given to her at the end of Cinder by Dr. Erland to mount an escape that takes her through the jail cell of ex-Air Force cadet Carswell Thorne. Thorne is a rogue and a thief, but he is quite charming about it all. Since he has a ship, Cinder partners up with him, and they escape together. These two “couples” are on somewhat of a crash course moving toward one another. Instead of going directly to Africa, though, to help Dr. Erlander with his plan to defeat the evil Queen Levana, Cinder and Thorne head to Europe to find former military pilot Michelle Benoit—a woman with connections to Cinder’s past. While the four try in various ways to find Scarlet’s grandmother, we are given glimpses of Kai and his tense struggle to lead the Eastern Comm0nwealth as well as his recently deceased father did, particularly by avoiding war with the Lunars. Unfortunately, there are components that did not leave me feeling satisfied with this installment of the series. As an English teacher, I read with a critical eye that I sometimes have a very hard time ignoring. The repetitious word use in the book may not bother others, but I found myself zeroing in on the 38 versions of the word “gulp” and 23 versions of “gasp.” (Because I was reading the book on my computer, it was easy to search and find to count the transgressions.) Also, as the book continued, Scarlet’s behavior became less believable; she seemed less gutsy in her impetuous behavior and more ridiculous. I will probably wait to read the third book in the quartet, Cress—which is based on Rapunzel and will be set in Northern Africa—until after I have read various reviews instead of rushing out to buy it like I did Scarlet. Your analysis left me disappointed. I was looking for a review. Not a synopsis. I am sorry to hear that. You could read in-depth reviews of Fairest and Cress. I will be covering Winter when it is released in a few weeks.